Sonequa Martin-Green portrays the lead role of Michael Burnham in "Star Trek: Discovery," which premieres Sept. 24, 2017. 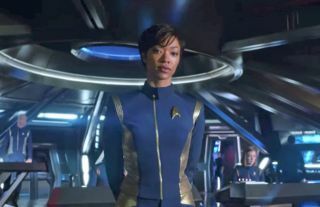 Among the reveals Saturday at the "Star Trek: Discovery" panel at San Diego Comic-Con is that lead character Micheal Burnham (Sonequa Martin-Green) is the biological daughter of Spock's mother Amanda , and Spock's father Sarek is her surrogate father. "Star Trek: Discovery" premieres Sept. 24 on CBS before moving to the CBS All Access app, which requires a paid subscription, for the remainder of the first season. Get full San Diego Comic-Con 2017 coverage from Newsarama, Space.com's sister site, this weekend. Originally published on our sister site Newsarama.